Wolf Creek Ski Area is located on Highway 160 between South Fork and Pagosa Springs, Colorado in the San Juan Mountains. 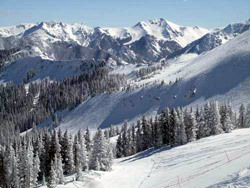 It is best known for receiving the most average snowfall for all the ski resorts in Colorado and Forbes Traveler Magazine recognized it as one of the Top 20 Snowiest Ski Resorts in the World! It also received the 2010 OnTheSnow Visitors Choice award for the Rockies. At the Wolf Creek Ski Area there is something for everyone. The mountain is divided pretty close to even for the different levels with approximately 20% for beginner, 35% for intermediate, 25% for advanced, and 20% for expert level. There also are ski and snowboarding classes to get everyone started. Wolf Creek Ski Area lifts are open from 8:30 A.M. to 4:00 P.M and the ticket office is open from 8:15 A.M. to 4:30 P.M.
Wolf Creek Ski Area is a great place to ski or snowboard. While it may be a smaller mountain I find it very enjoyable. With smaller mountains come less people which equals less time waiting in lift lines. I have been skiing on Christmas Eve Day and never had to wait more than a few minutes for a lift. I find the prices very reasonable and enjoy going on Local Appreciation Days as the prices are cut in half. 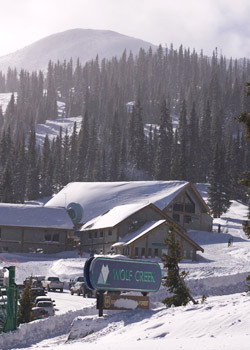 Wolf Creek Ski Area provides ski and snowboard rentals for reasonable prices. Adult ski sets are $14 a day and snowboarding is $26 per day. Rentals for children are a few dollars less. Ski rental takes place in the Sports Center building located across from the ticket counter. 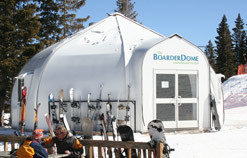 Snowboarding rental is in the Boarder Dome next to the Wolf Creek Lodge just up the stairs from the ticket counter. They do not rent helmets or snow clothing so come prepared! There are a variety of lesson options at Wolf Creek Ski Area and all can be purchased at the ticket office. Wolf Creek Ski Area offers group and beginner ski school lessons that are available for all ability levels of skiers and snowboards so if you are just beginning or want to improve your skills there is a class for you! The beginner packages are designed for those who have never skied/snowboarded before. This includes a lift ticket to the Nova Lift ONLY (easiest lift) and four hours of professional instructions. All of the instructors that I have ever encountered are extremely knowledgeable and helpful. Don’t feel embarrassed asking questions or taking more time down a run. They are also great with kids. My kids elementary school used to take the students skiing twice a year and a half day of lessons was required and they thought the instructors were great! I would highly recommend a few hours of lessons to all beginners to learn the basics and avoid a lot of frustration! There are also private lessons available which allow a more personal and in-depth learning experience. These lessons focus on form and establishing better technique. Private lessons are available to both skiers and snowboarders of all ages from beginners to experts. Wolf Pups is a great way to get your kids into skiing (snowboarders must take private lessons). The Wolf Pups program is designed for children ages 5 to 8 and is appropriate for beginners to strong intermediates. The Wolf Pup tickets include an all day, all mountain lift ticket and your choice of either two or four hours of professional instruction that is specifically geared to children. A full day which is the four hours of instruction also includes lunch and snacks. The Wolf Pups program has its own lift and building which gives children a chance to meet friends and enjoy a day on the slopes. It also allows parents to enjoy some free time skiing tougher runs! There are several places to eat while at the Wolf Creek Ski Area. Wolf Creek Lodge, also known as the Upper Lodge, has delicious, affordable food. It is a cafeteria style restaurant with a salad bar, homemade soups and chili. You can also order hamburgers, cheeseburgers, and specialty burgers such as the Wolf Burger straight off the grill. Hot dogs and bratwurst are also available as well as deli sandwiches. There are many drinks to choose, from hot coffee and apple cider to a wide selection of cold drinks. There is also candy bars for the perfect snack on the mountain! On really busy days enjoy an outside meal from the “The Outside Grill” which has burgers and brats. There are picnic tables outside the lodge so you can enjoy the crisp Colorado air. Also in the Wolf Creek Lodge is the Pathfinder Bar which offers a selection of beers, hot wine, and mixed drinks. The Pathfinder Bar serves many special label beers and ales. Don’t forget to try out one of their specialty drinks such as Winterberry, Vertical Drop, or Bunwarmer. The bar is open from 11 A.M. to 4:30 P.M. The bathrooms are located downstairs and there is only an outside entrance. The Prospector Grill is located just behind the ticket office. It is mainly known for its outstanding breakfast! Breakfast is served from 8:30 A.M. to 11:00 A.M. and includes: omelets, breakfast burritos, bacon, ham, sausage, hash browns, biscuits with gravy, and French toast. Don’t worry if you missed breakfast as the Prospector Grill also serves pizza, Frito pies, hamburgers, cheeseburgers, and homemade soups. Homemade cookies also make a great snack! There are bathrooms and a courtesy phone located downstairs in the building. Base Camp is the perfect place if you like to bring your own lunch. It has open storage cubbies for your coolers. This is where I almost always eat. I find it much more relaxing to bring your own food and not have to wait in line. It is also so easy to ski right next to the building and then just walk inside. There are inside and outside tables as well as hot and cold beverages and snacks sold here. The bathrooms are located downstairs along with the lockers. The cost of a locker is $0.75, for small personal possessions. I have been leaving my cooler and bags in the open cubbies for years and have never had any problems with theft or people moving my stuff. The Raven’s Nest is Wolf Creek Ski Area’s newest dining. It offers grilled burgers, sandwiches, soups, and desserts. It is located at the Top of the Raven Lift. There are also restrooms located in this building. 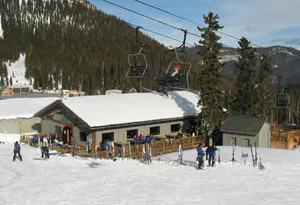 Alberta Grill is located at the bottom of Alberta Lift. It allows you to place your order with the attendant for one of their delicious grilled burgers, go on one more run and when you return your burger will be done. This allows for maximum time on the slopes and no waiting in line! The Alberta Grill also has lots of snacks such as brownies, cookies, and rice crispy treats! It is a great place for skiers and boarders to take a break without having to go back to the main base area. There is no lodging at Wolf Creek Ski Area. The closest lodging is Pagosa Springs which is west of the ski area or South Fork which is to the east. Both have hotels and restaurants to make your stay more enjoyable. 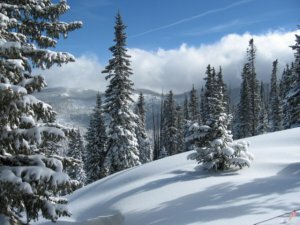 A word of warning is that during heavy snow storms the Pagosa Springs side of Wolf Creek Pass is often closed due to avalanche danger. This means you can’t get to Wolf Creek Ski Area from that side. While this is a bummer for the people on the western side of the ski area it means fewer people on the slopes for the people that can get there. Check the weather forecast as well as the road report to see if there are any closures. As with all areas of the Rocky Mountains the weather can change rapidly. It is best to be prepared and dress in layers that can be added or removed as the weather changes. It is also a good idea to bring an extra pair of socks and gloves. Also remember that at higher elevations you are exposed to more of the sun’s UV rays. Snow also reflects UV rays making it very easy to sunburn. It is crucial that you apply and reapply sunscreen, even on cloudy days. Your lips will also be grateful if you use a lip balm with sunscreen in it. Sunglasses or goggles with UV protection are also essential for a day on the slopes. With a base elevation of 10,300 feet and summit elevation of 11,900 feet people can experience altitude sickness, especially when coming from very low elevations. Altitude sickness is caused by gaining elevation more quickly than your body can adjust to the thin air at high elevations. Mild cases are common and symptoms include throbbing headache and nausea. This can usually be avoided by taking it easy and relaxing your first day at high elevations. If you experience confusion, loss of motor skills, or blue/gray lips, seek help immediately. There are prescriptions available that help speed up your acclimation to high altitudes so consult your doctor before heading to the slopes! Have a great time at Wolf Creek Ski Area!! Special thanks to Wolf Creek Ski Area for the use of their pictures.